The subspecialty of nephrology faces several critical challenges, including declining interest among medical students and internal medicine residents and worrisome declines in the number of applicants for nephrology fellowships. There is an urgent need to more clearly define the subspecialty and its scope of practice, reinvigorate meaningful research training and activities among trainees, and ensure that fellows who complete training and enter the practice of nephrology are experts in the broad scope of nephrology. This need requires a critical look at fellowship training programs and training requirements. A new workforce analysis is also needed that is not focused on primarily meeting estimated future clinical needs but rather, ensuring that there is alignment of supply and demand for nephrology trainees, which will ensure that those entering nephrology fellowships are highly qualified and capable of becoming outstanding nephrologists and that there are desirable employment opportunities for them when they complete their training. Much has been written about the problems facing nephrology. Concerns include a workforce shortage (1–4), declining interest in nephrology among trainees (5–7), erosion of our practice scope by other specialists (8–12), constraints on reimbursement, demand to meet care quality metrics and meaningful use requirements, and new care models, including accountable care organizations and ESRD seamless care organizations (13,14). In 2009, Lane and Brown (15) published an article asking the question: “Nephrology: a specialty in need of resuscitation?” Five years later, these concerns remain and may have worsened. We believe that there are concrete steps that can and should be taken today to resuscitate the specialty, but they entail decisions and choices that will be difficult. Here, we articulate four such steps (Table 1). We first need to clarify our subspecialty’s scope of practice to nephrologists and non-nephrologists. The care of patients with CKD and ESRD has become the primary focus of clinical nephrology, a development reflected in the recently revised American Board of Internal Medicine (ABIM) Nephrology Blueprint (16). However, several disease processes traditionally considered primarily, if not exclusively, within the cognitive scope of nephrology are, at times, now managed by those in other specialty areas; intensivists treat AKI, rheumatologists treat lupus nephritis and renal vasculitis, and hospitalists manage complex fluid–electrolyte disorders to cite only a few of many examples. Unlike some other medicine subspecialty areas, such as cardiology, gastroenterology, and pulmonary medicine, procedural training requirements for nephrology are limited (to kidney biopsies and hemodialysis catheter placement), and therefore, after fellowship, very few nephrologists perform procedures such as placement of peritoneal dialysis catheters, hemodialysis access interventions, and even kidney biopsies. The question of whether competence in dialysis catheter placement and kidney biopsies should even continue to be required was debated at a recent American Society of Nephrology (ASN) Training Program Director’s meeting. It is noteworthy that competence in kidney ultrasound is not required for nephrology training (17), even as bedside ultrasonography is increasingly part of training in internal medicine, emergency medicine, and other specialties and medical student education (18). Clarifying and redefining the scope of practice of nephrologists may not be easy and will likely require asking and answering some difficult questions (Table 1). We should understand what referring primary care providers, intensivists, oncologists, urologists, obstetricians, and surgeons expect when requesting nephrology consultation. We also must clearly delineate how services that we provide differ from those provided by hospitalists, intensivists, and others who may manage patients with problems traditionally considered within the scope of practice of nephrology. Unless we can document to our colleagues (and patients) that we add value to the care provided to patients, our existence will be increasingly hard to justify. The second need is to right size the nephrology workforce on the basis of realistic estimates of demand for nephrologists not from projections of estimated future clinical needs but instead, from estimates of the job market available to our trainees whether in practice, academia, or industry. We are concerned that there is great risk that supply, considered in the context of the job market, will exceed demand if it has not done so already. Although there has been declining interest in nephrology careers among internal medicine residents, particularly those trained at United States medical schools, during the last 5–10 years (7,19), the number of nephrology fellowship training programs and positions has increased markedly (Figure 1). Between 2009 and 2013, the number of residents registering for nephrology fellowships through the Electronic Residency Application Service declined from 756 to 535, with declining numbers of both United States–trained and internationally-trained applicants (20). Nearly three quarters of those who registered were international medical graduates. In the most recent nephrology subspecialty match (2014–2015), 24% of certified positions and 44% of programs went unfilled. Of 306 matched applicants, only 90 were United States medical school graduates (21). Despite the decline in interest in nephrology careers, there has been an increase of five Accreditation Council for Graduate Medical Education (ACGME)–approved training programs (142 in 2009–2010 and 147 in 2013–2014) and 77 approved training positions (869 in 2009–2010 and 946 in 2013–2014) during the past 5 years alone (22). There were only 128 programs and 692 approved training positions in 2001–2002. 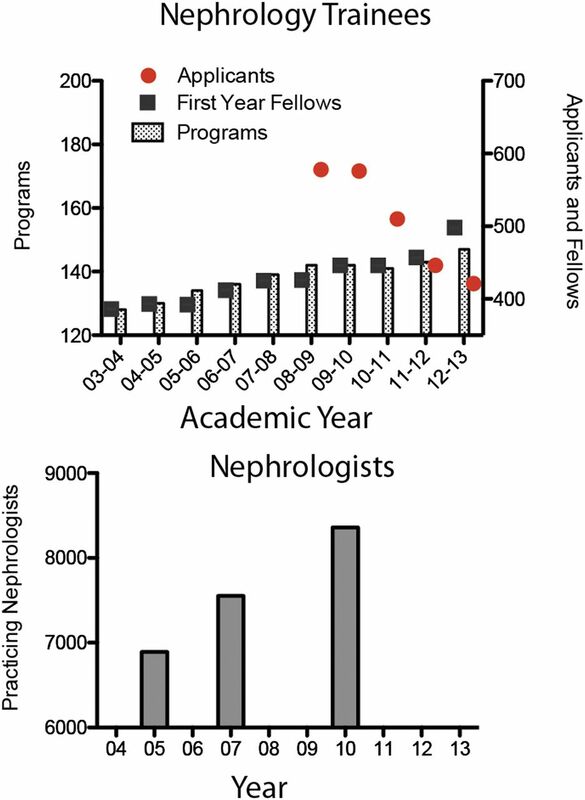 Over the last 5 years, as a consequence of these changes, the number of applicants per fellowship position in nephrology has declined from 1.5 to 0.8, with an increase in the percentage of applicants matched increasing from 61.1% to 94.7%, indicating a marked decline in the selectivity of nephrology training programs as a whole (21). Most other internal medicine fellowships have applicant-to-position ratios of 1.1–1.5. To return to a ratio of even 1.0, assuming no additional decline in the number of applicants, would require a 20% reduction in training spots. An even greater reduction would, of course, be needed if there is continued erosion in applicant numbers. The number of training programs and positions and practicing nephrologists has been increasing as applications for nephrology fellowships have declined. Data from Association of American Medical Colleges, Accreditation Council for Graduate Medical Education, and National Resident Matching Program. The growth in the number of training programs and slots has likely been driven by a variety of factors, including a perceived workforce shortage (23), efforts by both academic and private practice nephrologists to enhance their own workforce to meet clinical demands, and the laudable desire to develop and maintain teaching programs by both academic and practicing nephrologists. This increase in training slots has led to a dramatic increase in nephrologists (Figure 1). Between 2005 and 2010, nephrology grew more rapidly than any internal medicine subspecialty other than geriatrics (24). The increasing number of graduating trainees and practicing nephrologists may in the near future, if it has not already, lead to a sluggish job market for new trainees. To right size the number of graduating fellows given the current pool of practicing nephrologists, we need to know what the demand for nephrologists will be in the job market. Although such estimates are never firm, there is evidence that demand may be weaker than many previously anticipated. First, it is illustrative to compare the number of nephrologists in the United States and Canada. In Canada, there are 1.7 nephrologists per 100,000 people (25), whereas in the United States, there are approximately 2.7 nephrologists per 100,000 people (24). It should come as little surprise, therefore, that the average salary of nephrologists in Canada is >2-fold higher than that of their colleagues on this side of the border (26). Second, there is a perception that the number of available nephrology employment positions has declined; the number of open advertisements for nephrologists through one large dialysis organization declined by 60% during the last 5 years (27). Third, the rate of new ESRD cases per 1 million people, relatively stable since 2000, fell 3.8% in 2011, perhaps signifying a reversal in trends that had led some experts to believe that a larger nephrology workforce was needed to care for a growing ESRD population (28). Fourth, 65% of practicing nephrologists in 2010 were under the age of 55 years, suggesting that the current nephrology workforce has many years yet to practice (20). When assessing future demand, it will be essential to incorporate care models that fully incorporate nurse practitioners and physician assistants, which has happened in many other specialties (29,30). Pursuing this model in nephrology practices will align nicely with current trends toward more team-based care but likely further reduce demand for nephrologists. A decline in professional opportunity after fellowship, whether real or perceived, is likely one factor contributing to the decline in fellowship applicant numbers (19), perhaps particularly among international medical graduates. Although there are still superb applicants for nephrology fellowships, it is difficult to imagine that the declining interest in nephrology careers will not eventually affect the quality of the overall applicant pool to at least some extent if it has not done so already. Reducing fellowship sizes and/or the number of fellowship training programs may increase applicant interest and sustain a high-quality applicant pool if supply and demand are more closely aligned. Furthermore, if trainees, such as medical students and residents in internal medicine, see nephrology fellows who are not of the highest caliber and seem less qualified than fellows in other subspecialty areas, our subspecialty becomes even less attractive to them. Reaching a new equilibrium may be very difficult and will not occur rapidly. The third need is to develop and enhance training standards that foster development of all current and future trainees and ensure that they have reached appropriate skill levels at the end of their training. Some training programs seem to fail to assure that their graduates are competent across the full spectrum of nephrology practice (31,32). In a survey of recently trained nephrologists, nearly 20% of 133 respondents indicated that they did not feel competent in caring for in-center hemodialysis patients, 45% did not feel competent in caring for peritoneal dialysis patients, and 84% did not feel competent in caring for home hemodialysis patients (31). Although most (but not all) felt competent in performing acute hemodialysis and continuous RRT, there were many procedures and areas of skill and knowledge in which a substantial percentage of respondents indicated that they did not feel that they had received adequate training or were competent. For example, a majority of respondents did not feel well trained and competent in business aspects of nephrology, genetic renal diseases, renal complications of pregnancy, management of poisoning, clinical pharmacology, end-of-life care, and interpretation of renal ultrasound and other renal imaging studies, but they did report that these areas were important in their clinical practices. Achieving the expertise necessary to practice independently requires both extensive didactic teaching and extensive clinical exposure. Clinical experiences must be supervised by faculty physicians who themselves are experienced and highly skilled experts in nephrology. To achieve this expertise, every training program must have a program director whose time is protected to manage the fellowship program and mentor its fellows and a well rounded and diverse faculty committed to excellence in medical education. The teaching faculty must be expert in assessing the competencies of its trainees and capable of providing its trainees with a rigorous scientifically-based didactic curriculum, including in-depth exposure to the basic science, physiologic, and pathophysiologic underpinnings of nephrology. Every training program must have adequate numbers of patients receiving peritoneal dialysis and home hemodialysis available to its trainees, provide exposure to patients before, during, and after kidney transplantation, offer adequate numbers of kidney biopsies and ample opportunities to interact frequently with renal pathologists, and direct exposure to renal imaging studies, including access intervention. In addition to supervised longitudinal experience in the care of patients with acute and chronic kidney diseases treated with the full spectrum of available dialysis modalities, fellows must become reasonably expert in clinical pharmacology, renal pathology, renal imaging, intensive care nephrology, end-of-life care, and care of patients with acute GN, pregnancy-related kidney disease, kidney stones, cancer-related kidney disease, and many other topics that define nephrology practice. To achieve this expertise, in addition to having the necessary qualified faculty, training program requirements must be more specific and rigorous to ensure that the depth of expertise of the newly trained nephrologist is adequate. For instance, ACGME Program Requirements in nephrology specify that “the program should be of sufficient size to ensure fellows’ adequate exposure to patients with acute kidney injury, and chronic dialysis both hemodialysis and peritoneal dialysis including patients who utilize home dialysis treatment modalities, in order to ensure adequate education and experience in chronic dialysis” (33). Minimal experience with each dialysis modality should be explicitly defined as well as the level of skill needed in caring for patients treated with each modality. For many areas of nephrology, the requirement is only that fellows “demonstrate knowledge” (33). The requirement that “fellows should have at least four months of experience with dialysis therapies, both hemodialysis and peritoneal dialysis” (33) is not specific enough and allows far too much interpretation as to what experiences are required and how competence is determined. Data informing procedural competency in nephrology, such as that available regarding placement of temporary dialysis catheters (34), should be used to establish explicit training requirements, which has been done in most other subspecialties (35–37). The need to develop evidence-based procedural guidelines that establish the standards for high-quality patient care and nephrology fellow competence has been emphasized (38). Establishing such standards should help us retain primacy as the most expert and qualified care providers for patients with kidney disease. We need to also make sure that fellows are well prepared to thrive in the face of a changing health care environment, with skills in chronic disease management and interdisciplinary team-based care and the tools necessary to provide high-quality value-based patient-centered health care (39) in new and emerging health care delivery systems. Through the ACGME’s Next Accreditation System, training milestones are being developed for all training programs, including nephrology (40). Through the efforts of various groups, including the ASN and its Training Program Director Executive Committee Chair, draft milestones for nephrology have been created. Implementation of these milestones into trainee competency assessments of the care of patients with AKI and ESRD, performance of each dialysis modality, and other key skill areas should be helpful, provided that they are accurately and rigorously applied. We hope that the ASN along with the new ABIM Nephrology Subspecialty Board will work together to ensure that these requirements and future training and assessment requirements reinforce the expectation that all nephrology fellowship graduates are well prepared for practice. A fourth need is to own our field, including its research scope. Although clinical expertise has always been shared between subspecialists, our loss of pre-eminence in some clinical arenas seems to be paralleled by a slipping presence in scholarship. Increasingly, research—particularly clinical research in traditionally nephrology arenas—is conducted by non-nephrologists and appears in journals devoted to critical care, cardiology, rheumatology, and other fields. There is an increasing tendency to think of research as a distraction from clinical training rather than a driving force in maintaining our scope of expertise. Nephrology’s attempts to make programs less rigorous have not, to date, increased interest in the field. We need to better articulate the case to applicants as well as our faculty that the value of nephrology to our colleagues and future trainees demands critical thinking that only is learned through scholarship. The prohibition against use of National Institutes of Health–sponsored training grants to support training of fellows on visas is especially problematic for nephrology given the high proportion of international graduates in training. Alternative funding sources should be established to support research training for these individuals. A renewed focus on research will also help prepare our trainees to translate what are likely to be unprecedented advances in biomedical science (for instance, in genomics, proteomics, pharmacogenomics, and the evolving area of personalized medicine) into clinical patient care. Rapid advances in these areas are likely to change how we diagnose and treat kidney disease and transplantation (41). Training programs must be able to stimulate fellows so that they can be innovative and translate these basic science advances into their care of patients. There is an urgent need to critically examine the number of training programs and positions that we have in nephrology to address two fundamental questions. First, is there a reasonable match between the number of fellowship graduates each year and the marketplace demand for them? Second, will the number of available training positions, in the face of declining interest in nephrology, outpace the ability to recruit sufficient numbers of highly qualified residents capable of becoming the outstanding nephrologists that we all desire to train? It is also imperative that we set clear rigorous expectations for nephrology fellow training if we are going to retain the respect and trust of our colleagues and maintain our contract with the public. All nephrology trainees must be able to add real value to disease management and every patient encounter and be fully competent in the broad range of nephrology-specific procedures and treatment modalities. We must define what core skills every nephrologist must possess, and also what specialized skills may comprise areas of focused practice. The newly formed ABIM Nephrology Subspecialty Board should help in aligning new practice patterns with improved methods of assessment. Entrustable has become a buzzword in medical education. In the context of medical education, this word implies that a practitioner has shown the necessary knowledge, skills, and attitudes to be trusted to competently and independently perform an activity that is core to the subspecialty or subspecialty of the trainee without direct supervision (42,43). An important implication of entrustment is whether a training program director and the program’s teaching faculty would trust the care of family and friends to each of their fellows on completion of his or her fellowship? If not, their training has failed. We believe that one of the foremost responsibilities of training program directors in nephrology, other nephrology educators, and our professional societies and organizations, including the ACGME, the ASN, and the ABIM, is to assure that those who complete training and enter the practice of nephrology are the experts that we need and expect them to be. J.S.B. received consulting fees and honorarium from Amgen and previously served on the Board of Directors of the Renal Physicians Association (RPA). D.H.E. has received honoraria from AstraZeneca. M.H.R. currently serves on the Board of Directors of the RPA. S.L. has no disclosures to report. J.S.B. is a member of the American Board of Internal Medicine (ABIM) Nephrology Test Writing Committee and Chair-Elect of the ABIM Nephrology Subspecialty Board. D.H.E. is a member of the ABIM Council and Chair of the Subspecialty Board of Nephrology. S.L. is Treasurer of the ABIM Board of Directors. All views expressed herein are solely those of the authors and do not necessarily reflect the views of the ABIM.